Sometimes in life one little thing makes a very big difference. It’s the same with this oatmeal cookie recipe. It looks like a standard oatmeal cookie recipe. It has oats and butter and sugar and chocolate chips (because an oatmeal cookie with raisins is a poor excuse for an oatmeal cookie). But then it has something else. Something that adds a rich, velvety flavor to this cookie that is simply addictive. That is absolutely memorable. 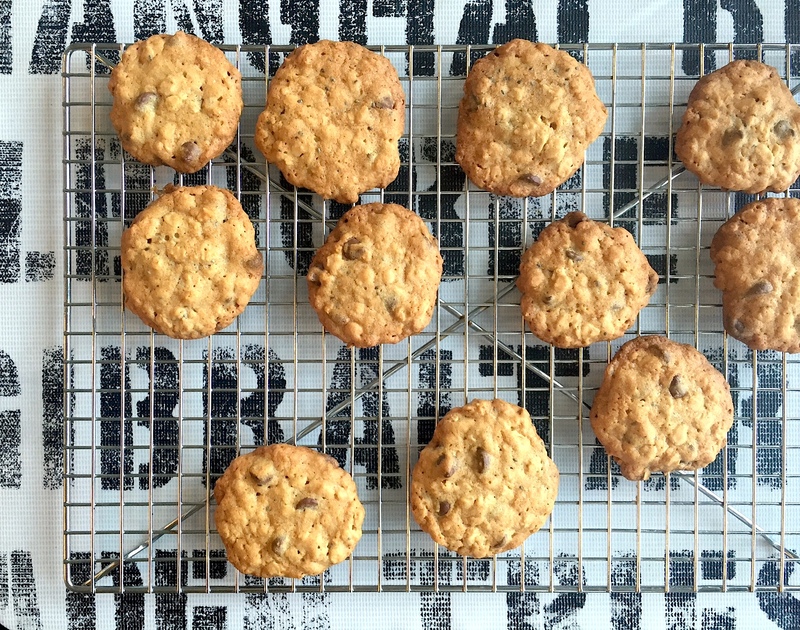 That makes it the only oatmeal cookie you will ever need to make. That something else is one tablespoon of molasses. One little tablespoon that makes a big difference. Buy a jar of molasses. You may think it’s going to gather dust in your pantry and it very well might…until you make these cookies and start craving them every other day. That jar of molasses will be gone in no time. Promise. Cream the butter, sugar and molasses together in a stand mixer. Beat until well combined and ‘creamy’. Add the egg and vanilla to the butter mixture and continue beating until well combined. Meanwhile whisk the flour, oats, salt, baking powder and salt together in a separate bowl. Gradually add the flour mix to the wet mixture, beating just until combined. Fold in the chocolate chips and chia seeds by hand. Using a tablespoon scoop out a ball of the dough and drop onto a lightly greased cookie tray. Flatten slightly. Bake for 13-15 minutes (mine were good at 13) and allow to cool for ten. Make them again in two days. Hurray! I had oatmeal cookies on my to-do list for this weekend to take on a road trip. I was just going to use the recipe on the back of the Oats carton. If I’m looking to make two dozen or so do you think I should double it (assuming that each cookie is about a tbsp of dough)? Oh yes, definitely try these. I feel like this recipe yielded close to two dozen for me so I wouldn’t double it…that will be a LOT of cookies. Good luck! Can’t wait to make these this weekend. These cookies turned out so well. I baked them for an Easter party and everyone loved them. Hmmm. Mine weren’t super chewy but I cooked them long because I love a crispy cookie. But the molasses definitely gave us a rich, warm, yummy flavor. Glad you loved!